Socks was turning into a greater character week by week. I had taken Hughie from their field & was brushing him prior to tacking up for a hack around the road. The next thing I knew, Socks was alongside us wanting to get groomed too. I couldn't understand how he'd managed to follow us as I'd locked the gate. When I looked down at him, his legs were soaking wet! He'd waded out into the loch, found the end of the fence & gone around it to get to us. Little did we know that this little 'occurrence' was only the beginning!! Socks' first foal arrived. What a darling! A skewbald filly foal called Benston Quartz off Swarthoull Veeda. So, so chuffed. An inquisitive nature & so sweet. A very mature head on young shoulders just like her sire. 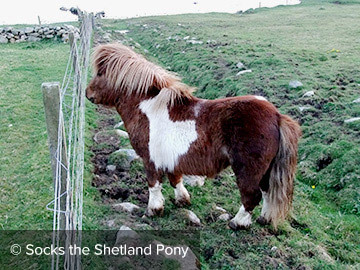 Socks & 2 fillies (Orianna & his ½ sister Porsche) travelled to Cousland, Dalkeith at the end of June for a few weeks rest before attending the 2011 Shetland Pony Breed Show in Falkirk at the end of July. The travel & hard work were well worth it when Socks was 2nd in his class thanks to John Lawrie for his superb handling & showing. The standard for all classes was very high so I was delighted with the result. 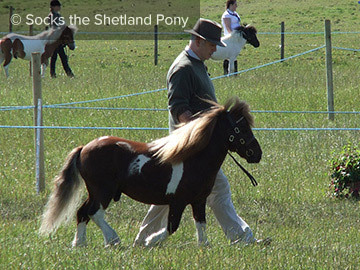 Orianna came 6th in her class & was Best Shetland Bred Pony in the Miniature Ring. Porsche was having an off day (think the baking heat was getting to her) so she was well down the placings.